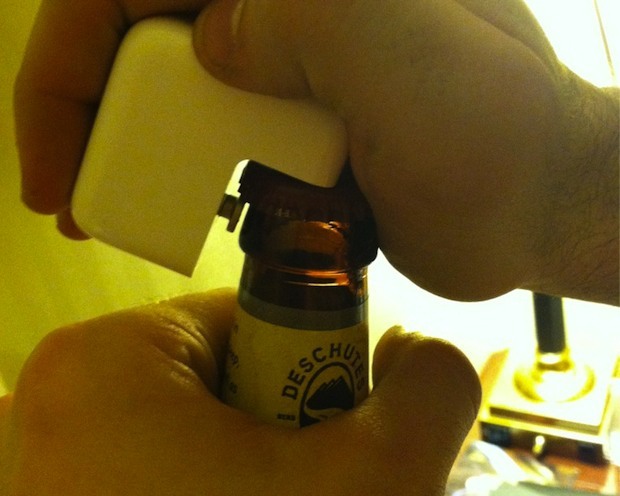 The next time you’re in desperate need to crack open a beer bottle, reach for your iPad power adapter. Say what? Well, apparently it can double as a bottle opener, not that we’d recommend that. This may be the ultimate Apple-geek party trick and I’m sure college students the world over are rejoicing in their dorms right now at this exciting new discovery, but that doesn’t mean anyone endorses this practice or that we’d recommend you trying. Using an iPad power brick as a bottle opener is almost certainly not covered by your AppleCare warranty so don’t cry to Apple or anyone else if you break something in the process. We certainly aren’t going to try it ourselves, though this should also work with the MacBook Pro & Air MagSafe charger too. But you’re entirely on your own here, so party on. Heads up to @EvaZebra for discovering the revolution on Twitter, you should follow us there too. And yes, I know what you’re thinking, maybe it was a one time thing and doesn’t work, right? Well, it has been confirmed to work many times over with a variety of different MagSafe adapters from iPads to MacBook Pros, a gazillion of these images have been tweeted at us so it surely works, but we strongly do not recommend doing this yourself as it could break the MagSafe cable, damage the adapter, or cause who knows what kind of ruckus. You should probably just get a beer bottle opener. Or not, and take your own risk. Either way, have fun. Brilliant, Apple truly thinks of everything. That can’t be a coincidence. Deschutes Brewery makes a great beer too. AMEN!! All I know is I want some Mirror Pond!!! Everything is a beer opener. If not, you are not thirsty. enough. Using an iPad itself would work perfectly too. Actually that is an awesome trick. It comes in handy when I beer that one exotic beer that requires a bottle opener. I no longer have to scurry around to find one. Awesome, but I still think I’d rather use my Opena iPhone bottle opener from http://www.openacase.com.